C-TEC's new Hush-Pro fire alarm solution provides fully monitored BS 5839-6 Grade C compliant detection, alarm, silencing and test facilities in domestic dwellings such as flats and apartments. As well as putting residents firmly in control of their own systems by allowing them to test and silence devices whilst standing at floor level, multiple Hush-Pro systems can be easily interfaced to a Landlord's system to help make stay put safer. 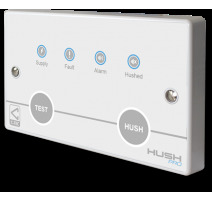 When used to its full potential, Hush-Pro can report fires, faults and other system data outside dwellings for action/analysis and provide the emergency services with optional manual evacuation controls. Visual alarms, voice sounders, cooker shut-off relays, telecare interfaces and vent controllers can all also be easily added to the system making Hush-Pro the perfect solution for high-rise, mixed-use buildings - and more! For an overview of our Hush-Pro solution view our Hush-Pro Video. Hush-Pro Domestic Fire Alarm Controllers There is 1 product.